The $299 Wren V5PF was the most attractive Play-Fi unit I tested for this roundup, and easily the most accurate in its sonic reproductions. It uses the first-gen Play-Fi chip, which supports only 2.4GHz 802.11, but the V5PF streamed just as well as units with the newer dual-band module. Once you’ve joined it to your local network, you can return your other devices to your faster 5GHz access point. Wren’s Web site would have you believe that the V5PF is an Android-only device, but that’s no longer true. Play-Fi has been updated to support iOS, and that includes the V5PF. In point of fact, you can download apps from the Play-Fi website to stream audio from any Android or iOS device or Windows PC to any Play-Fi device of any generation after a quick update. 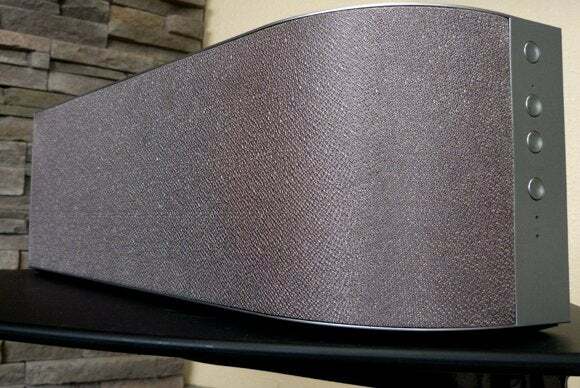 Measuring about 17 inches wide, 6 inches tall, and 4.25 inches deep, the wave-shaped V5PF will fit into all but the most cramped locations. There’s enough room inside to accommodate a 25-watt-per-channel amp, twin 3-inch drivers, two 3/4-inch tweeters, plus the air to let them reproduce low frequencies without a lot of trickery. Walnut veneer (bamboo is also available) lend the Wren V5PF visual flair. The back of the unit is home to a USB port (for loading new firmware and charging mobile devices), the setup button, the auxiliary audio input, and the AC jack. Controls are on the right-hand side: power/mute button (a ten-second press will power down), volume increase/decrease buttons, and a button to switch input between Wi-Fi and auxiliary. I’ve seen a number of reviews touting the V5PF’s audio quality. For the most part I agree. It’s a bit directional in the upper frequencies when you’re near it, but move out a couple of feet and things are fine. Generally speaking, I found its reproductions well-balanced throughout the frequency spectrum, though personally I’d like just a touch more glisten at the high-end. There’s enough bass to satisfy the average listener, and the unit can deliver what I consider uncomfortably loud music with little distortion and little change in color. Not surprisingly given its width, it provides slightly better stereo separation than the Polk Omni S2R does. Note that in addition to understating the V5PF’s device compatibility, Wren’s advertising uses the word “wood.” In reality, the front is covered in a fabric mesh and the rest of the MDF (medium-density fiberboard) cabinet is covered with your choice of walnut or bamboo veneer on the top, bottom and back. That’s not wood. Then again, neither is it vibration-susceptible plastic. As with most Play-Fi speakers, the Wren V5PF can play audio from an analog aux input as well as network connections. Most Play-Fi receivers can handle non-Play-Fi devices. The V5PF does it via an 1/8-inch auxiliary input rather than Bluetooth. This may not offer wireless convenience, but it sounds better. The Wren V5PF is affordable compared to Sonos units, but it’s a tad pricy for a Play-Fi device. It costs twice as much as Polk’s Omni S2 (the non-rechargeable version of the S2R, which I haven’t heard personally, but it has the same specs). It delivers accurate musical reproduction, looks luxurious, and features straightforward controls. Budgetary concerns absent, I’d love to have one in my house. The Wren V5PF is the most accurate sounding self-contained Play-Fi receiver/stereo box we’ve tested. It’s up there with Sonos in price, but also in quality.